This comes after discontent among anti-abortion customers burbled into the conservative blogosphere and filled the company’s Facebook page with angry comments and pictures of catalogs thrown in the trash. 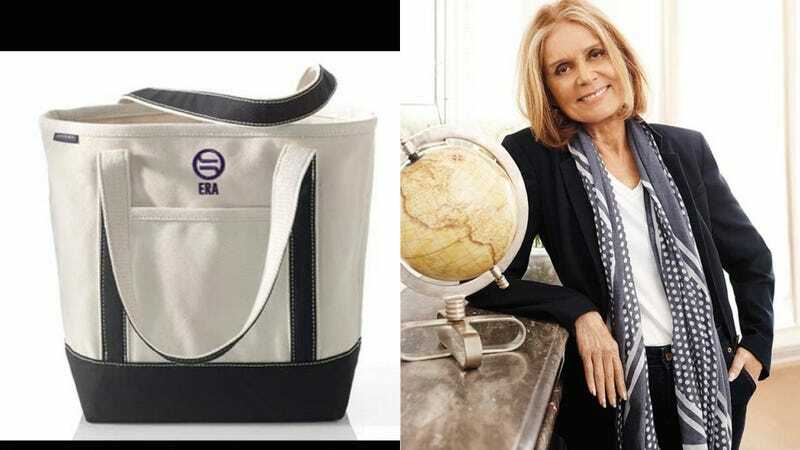 Though they’ve distanced themselves from Steinem herself, Lands’ End has not addressed their year-long commitment to donating money to the Fund for Women’s Equality; as of yesterday, they would donate $3 if you added the ERA Coalition label to your Lands’ End item of choice. That option appears to be gone from their website now. The offending interview did not—please note—touch on abortion. Mostly it just featured Gloria Steinem talking about style and dreams, which is apparently enough to send a certain segment of the Lands’ End customer base around the bend. Really it steered clear of almost anything controversial, except for the Equal Rights Amendment, and even then, Steinem kept it pretty middle-of-the-road: “We need a constitutional principle of female quality. The Equal Rights Amendment would give us a constitution that prohibits gender discrimination.” But LifeNews warns its readers that they should be afraid—very afraid—if this amendment passes. Might as well call it the Equal Abortions Amendment! Steinem’s description of the ERA sounded simple and uncontroversial in the interview. The amendment originally was introduced by pro-life feminist Alice Paul in 1923 to write women’s equality into the Constitution; but pro-lifers say new versions of the amendment could expand abortion. If a broad constitutional guarantee of protection for women’s rights facilitates to so much as a single abortion, we just gotta throw the idea in the trash with our Lands’ End catalogs. The irony is that Steinem looked great in the accompanying photo shoot and was impressively on-brand. Correction 1pm: This post originally misstated where donations were going, listing a U.N. Women effort, rather than the ERA Coalition’s Fund for Women’s Equality.